2009 HHR SS, loaded with every option, automatic, Sunroof, XM radio, One adult owner, ME. It has had a gentle and pampered life and no modifications, no chip, no paint work, bone stock original. The only thing not original is the tires. It has always been serviced regularly with Mobil 1. I bought this new for my now ex-wife’s grocery getter and that is what it was used for. She had a Solstice roadster and a Solstice Coupe for daily drivers but you can’t haul many groceries in them. I no longer have a wife, and Round Mountain has the best restaurant in Texas, maybe even the whole country, so I don’t need to go get groceries, so somebody is going to get a really good deal on a really nice limited production factory hotrod. pictures coming, but you probably already know what a bone stock HHR SS looks like anyway. 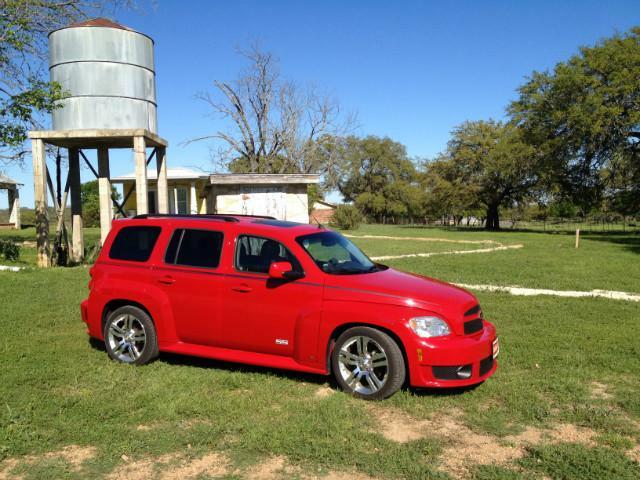 It is red with the solid black leather interior. I have the window sticker and all paperwork since new.